If your web site is running on Apache, and almost all are, there’s a simple way to protect directories on your web server. This method can be very secure, when combined with HTTPS and some good practices on your part, but it can also be a simple way to limit access to just a few people who know a password – perhaps as an alternative to Facebook sharing. You need to add two files to your web server, and it helps if you have access to a terminal/command prompt. Here are two key files and their their contents. These are basic .htaccess directives, that most web servers should allow. The first segment is to force the use of HTTPS, you might want uncomment that if HTTPS is important to your application. The second section turns on basic authentication and directs the web server to where to get the password file – you can put the password file anywhere your web server can access it and it does not have to be in the same folder as the .htaccess file. You are responsible for finding the full unix path to the file, either from the pwd command or the “Get Info” option inside a file browser. This file is the results of the command htpasswd -sc .htpasswd guest. The s after the – is for SHA-based password hashing and the c after the – is for create. The file can be added to or updated with the command htpasswd .htpasswd username. Run the command htpasswd --help for more information. Here are the results you’ve been waiting for: the results of RimCount.com tracking of the Roll Up The Win Campaign from a large Canadian Coffee and Donut chain. 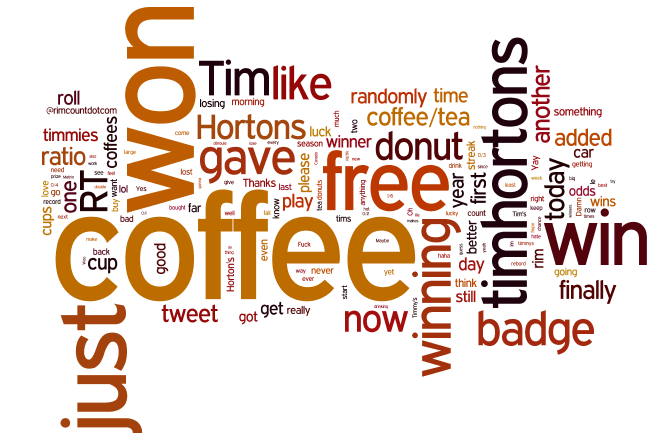 RimCount.com collected tweets with the hastag #rolluptherim and extracted ratios and recorded them. The site really took off when it started tweeting back with the Twitter account twitter.com/rimcountdotcom . The site automated the awarding and notification of “badges” for different items like drinking more than one “rim” a day, or tweeting about it more than once a day. Of course the best and worst record holders were notified. I was also contacted by the author of the Facebook App “My Rollups” apps.facebook.com/myrollups to compare notes – looks like Facebook users are a little luckier. Here’s looking forward to next year! You are currently browsing the iMatt :: The Blog of Matt Clare weblog archives for May, 2011 .